Richard Irwin (Belper, United Kingdom) on 25 October 2008 in Plant & Nature. A great macro Richard with stunning colours. Lovely frosty edge. Stunning colors. Great effect. I has you me in my favorites VFXY Photos. So beautiful!Lovely details.Great color & light! A fantastic series of shots,pure magic !! A lovely study of the season and of what is to come . . perfect framing. First frozen leaves ? Well captured. Wonderful gold colors. 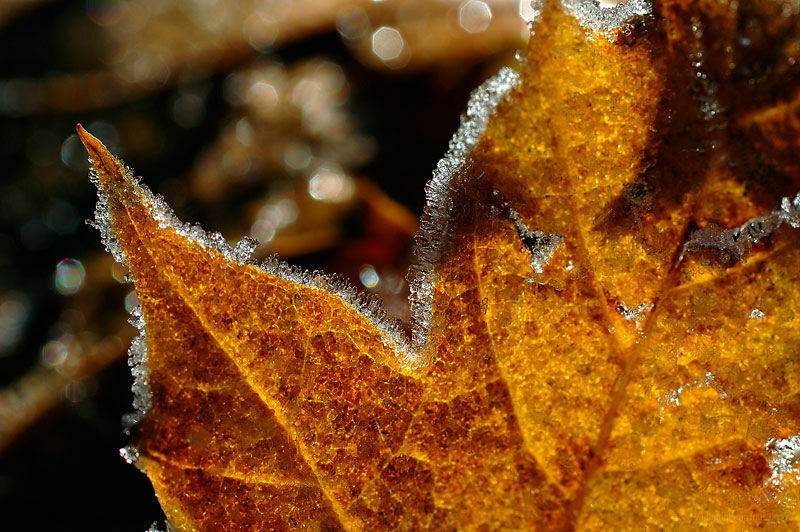 I love how the froze is drawing the contour of the leaf. Excellent one, really. Images like this make winter beautiful. Stunning close up! Lov the detail and the light! Beautiful! I know I said yesterday's post was my favorite, but this one is amazing! Exactly what October is! Well done. This is the best one of the serie. Well done. this is just beautiful ! the ice, the light and the colour ! This is simply a 5* for me. just gorgeous! what color, light and detail! like tiny gems!! bravo! !